Hi- I had my first taste of wheatgrass juice a few weeks ago after buying a box of frozen wheatgrass shots. I can only describe the flavour as intense and almost medicinal… it actually reminded me of something we were given when we were sick called Waterbury’s Compound or something they put in it- creosote? guaiacol? ethanol? sort of smoky and like aniseed but don’t let that turn you off- I think it was just the pure chlorophyll. After a couple of days though this taste became less intense and I liked the wheatgrass juice so much one shot wasn’t enough. Good medicine. I also tried the shots in green smoothies but the small amounts were lost with all the other greens but the juice still adds more green punch. 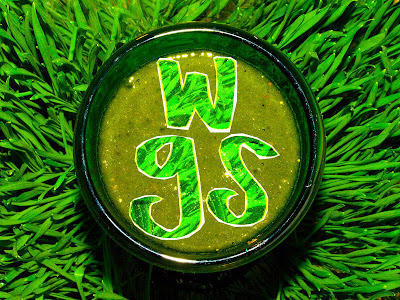 You can also buy powdered wheatgrass (and other super greens like spirulina) to throw in, and when you don’t have access to fresh greens and if you are travelling and can’t go without your daily green smoothie. Pack your blender! You don’t need a special juicer for wheatgrass smoothies- you can chop fresh wheatgrass up and throw it in with your other greens and keep all the fibre. I sometimes buy half a tray of still growing wheatgrass for $5 at the local organic shop and after cutting off at the base where it is less green you use it fresh or store in the fridge like any greens. Funny- up to about 2 years ago I used to think those trays of growing grass on stands outside the organic shop were purely for decoration enticing passing people in to the store!